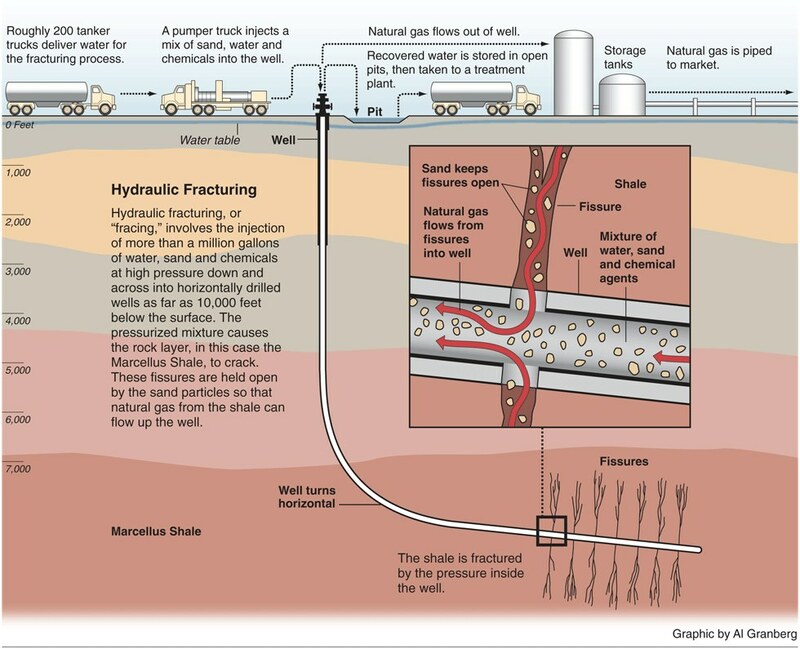 Hydraulic Fracturing, more commonly known as 'Fracking', uses explosives and high pressure water to break open shale rock formations deep underground and collect deposits of natural gas and oil trapped within the rock. After drilling a vertical shaft 6-8 thousand feet into the earth, the drilling process moves horizontally approximately one thousand feet through shale rock formations. When the drilling is complete, explosive charges are then inserted every 50 to 80 feet along the horizontal runs. When detonated, the charges create fractures in the rock which liberate methane (natural gas) trapped within the shale rock. High pressure "fracturing fluids" or "pumping fluids," made primarily of water and sand, are then injected into the well to further widen the fractures and release additional pockets of natural gas. The slurry is then retrieved and stored in retention basins for subsequent treating and recycling. After a setup period of one to three months, a fracked well can produce continuously for 20 to 40 years with the fracking process repeated nearly 20 times. Fracking technology was developed in the 1940s, and has become the drilling method of choice to extract the vast amounts of natural gas found in huge shale formations throughout the U.S. and world. Click here to see a brief video of the fracking process and here to see a map of the major shale gas formations in the U.S.
1. They fear the chemically treated slurry that is injected into the well will contaminate water above and below the ground. They believe it will either spread to underground water sources, or not be properly processed after it is pumped out of the well. The slurry is a proprietary cocktail of chemicals, some known to be toxic or carcinogenic. Opponents of fracking believe water contamination from the slurry is causing severe health effects and is being covered up by the oil and gas industry. They also question an apparent cozy relationship between federal lawmakers and the fracking industry. For example, the Energy Policy Act of 2005 exempted the fracking process from the requirements of the Clean Water Act, the Safe Drinking Water Act, and the Clean Air Act. 2. There are further concerns that breaking the shale rock will release naturally occurring radioactive gases or volatile organic compounds(VOCs) that could also permeate water sources or become airborne hazards. 3. The final concern is that the drilling and fracturing will destabilize the ground itself, making drilling areas more prone to earthquakes. 1. The rock fracturing and gas extraction process takes place thousands of feet into the earth, safely away from sources of groundwater and drinking water. 2. The central shaft is lined with steel piping and cement, blocking the spread of any fluids into the ground. 3. The fracking slurry is made up of only 0.5 percent chemicals many of which are found in common household products like table salt, cleaners, disinfectants, food additives, soaps and detergents. The remaining components of the slurry are 90 percent water, and 9.5 percent sand. Click here to see a list of chemicals found in fracking slurry (p8). 4. In 2004, the U.S. EPA released a report confirming that hydraulic fracturing and the injected fluids posed little to no threat to underground sources of drinking water. No cases were found to link well water contamination to fracturing fluids. In 2009 the Ground Water Protection Council (GWPC) released a similar document refuting accounts that fracturing fluid had contaminated drinking water. 5. The industry acknowledges seismic activity near and around drill sites, but these tremors are so small we do not feel them. They question whether they are actually the result of drilling or simply normal seismic movements that we are now seeing because we have sensitive equipment for monitoring them. In addition to an excellent track record of safety, hydraulic fracturing has had numerous economic impacts. The industry has created jobs, increased tax revenues, and helped to drive down natural gas prices. Here are a couple of examples cited by the American Petroleum Institute about the Marcellus Shale Formation. a. According to economists and industry experts at Penn State University, the Marcellus Shale Formation has the potential to be the second largest natural gas field in the world. A recent study estimates that in 2009 the development of this resource added over 44,000 new jobs in Pennsylvania, $389 million in state and local tax revenue, over $1 billion in federal tax revenue, and nearly $4 billion in value-added to the state's economy. Similarly, in West Virginia it created over 13,000 new jobs, and contributed over $220 million in federal, state, and local tax revenue and $939 million in value-added to the state's economy. b. According to the study, over the next decade, the development of Marcellus shale could generate nearly 300,000 new jobs, over $6 billion in federal, state, and local tax revenue and nearly $25 billion in value added to the economy by 2020. Despite the current controversy surrounding frack-gas drilling, one thing is known for sure. The discovery of natural gas trapped in shale formations and the development of techniques like hydraulic fracturing have been an enormous boon to the energy industry. They have opened up vast untapped supplies of natural gas and have created tens of thousands of manufacturing jobs. The onshore shale gas drilling has also reduced our dependency on riskier supplies of natural gas such as those found in the Gulf of Mexico. With the emergence of shale gas, the contribution of natural gas coming from the Gulf has decreased. According to Energy Information Agency data, offshore natural gas production from the Gulf of Mexico has declined by almost 50 percent from its level of 300,000 Bcf/month in 2005. The increased supply of cleaner burning natural gas is also causing policy makers and industry leaders to look to natural gas as a preferred fuel source in our country's energy portfolio. In the U.S. we consume an average of 66 Bcf of natural gas per day. Shale gas has already boosted our production capability by more than 2 Bcf/day over the same time last year. The EIA estimated that shale gas contributed to 16% of our total production in 2009, and projects it will increase to 26% by 2035. Despite these benefits, the debate over hydraulic fracturing is far from over. Industry leaders and environmentalists will continue to debate the pros and cons of this drilling technique. Independent Energy Consultants will continue to follow the issue and attempt to weed out the junk science and/or propaganda, to give our clients accurate and timely information from an industry and environmental perspective. Contact us for all your energy needs.